Greetings everyone! We pray that all are well and that Christ is continuing to make himself real in your lives. We have been in the United States for the past couple of months and it was great to see many of you while we were there. Unfortunately, we were unable to see some of you. 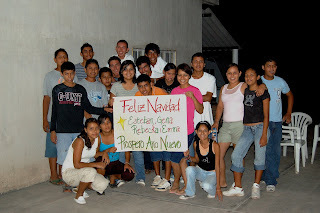 The staff in Cofradía has been doing a great job with the ministry, I’ve heard great reports. Right before we left in November, we held an Evangelistic Crusade in our new church building. It was the first meeting there and many people were blessed. My friend Pastor Rafael Gradilla from Hosanna Assembly in Bellevue, Washington came to speak Friday, Saturday, and Sunday services. It was a very busy, yet amazing time. A number of people came forward for prayer and we even had visitors from other towns who we’ve been visiting come for the first time! This was truly an exciting time! While we’ve been away, the youth ministry continued strong with the four student leaders we’ve raised up leading the group for the Saturday night meetings, a Christmas play, and another speed-soccer tournament. Missionary Amber Crafton has helped oversee that everything goes smoothly and the reports we’ve heard have been excellent! Not only did the youth have a soccer tournament, the adult men had a tournament of their own. What a fun way to bring the church together! Thank you for your continued prayers for the students and staff as the ministry continues to move forward! If you are interested in taking a Short-Term Mission team to Cofradía, please let us know by emailing us or contacting us another way. This year’s schedule is getting full! We spent ten days on the road to get to Washington in time to see some family at Thanksgiving time. After spending some time visiting family, friends and supporters, we spent two days in Leavenworth, Washington enjoying a sleigh ride, snow, and the town lights. That was the first time we’ve been on a “vacation” for a long time. It was great to spend time together as a family. Thanks to my Uncle Clayton who spent a number of days rebuilding a utility trailer for us so we could take it down to Mexico. That was such a blessing, thank you Uncle Clayton! We spent Christmas and New Years with my parents which was nice to spend more time with them. Rebecka and Emma really like the snow and it snowed on Christmas this year! Shortly afterward, we began to get things put together and packed into the trailer for our trip. As we started our trip south on January 7th, we decided to go down Highway 101 because of the reports of “chains required” in various areas on I-5 through the Siskiyous. We’ve wanted to take that route along the coast for a long time and it was worth it. We stopped to see the Tillimuk Cheese factory and the tree that you drive through in northern California. As I’m writing this, we are in Perris, California with Geña’s sister, Julia. We are looking forward to working with missionaries Doug and Jan Taylor at a Family Conference in Cofradia, a Student Leadership Conference, and more Short-term mission teams in February, March, and April. Thank you for your continued prayers over our family and ministry as the Lord makes himself real to all of us. Jonah was an interesting fellow. Once he finally obeyed God and went to Nineveh, the Lord blessed his ministry and had mercy on the people of Nineveh which made Jonah angry. He then goes outside the city to wait to see what happens and God provides a vine that grows over Jonah to give him shade from the sun which makes Jonah happy. The next day a worm eats the vine and it dies which makes Jonah angry. In the final verse God tells Jonah, “You have been concerned about this vine, though you did not tend it or make it grow. It sprang up overnight and died overnight. But Nineveh has more than a hundred and twenty thousand people…should I not be concerned about that great city?” (4:10-11; NIV). Jonah was more concerned about his own comfort than the lost people of Nineveh. How many times can I relate to that? Do I care more about my own comfort than I care seeing people come to Christ? The obvious answer is, “of course not!” But I have to admit that the truthful answer is that sometimes, I am more concerned about my own comfort than the eternal destiny of others. Lord, please forgive me of my selfishness. 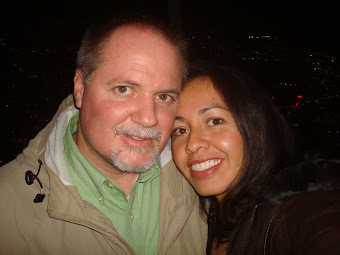 Indicate that it is for Steven & Efigenia Silberman and it will be put directly into our account. Make checks payable to CMC.